Check out the Top 10 Spookiest Cities in America and How to Throw a Halloween Party as part of our Halloween 2010 coverage. It appears that Hollywood's stars aren't always satisfied with the attention they receive in life, so they continue show-boating long after their final curtain call. These famous ghosts have clearly decided they're not done entertaining, and now haunt their old homes and hangouts. Some celebs are minor burdens to the new tenants, and others are all out ghoulish. Modern readers may have forgotten Mary Pickford, but the people living at her former home have not. Pickford was married to Douglas Fairbanks, but when things went south, they divorced and Mary kept the house. She later married Charles "Buddy" Rogers. The mega-mansion is currently on the market for $60 million. At its height, the Pickfair Estate was home to lavish parties for legends like Charlie Chaplin (is that really a woman on a cell phone in that Charlie Chaplin extra footage? ), George Bernard Shaw, and F. Scott Fitzgerald - and one ghost. After Mary's death, Charles Rogers reported seeing her wandering around the home as well. Then the spirits just kept coming. In the 1980s the home was apparently home to a ghosts of all kinds: a servant, Mary Pickford herself, an unidentified man, and a musical man that carried sheet music. The house was razed in the late-80s, which apparently exorcised the Pickfair spirits, but it still remains a Hollywood legend. One of the most recognizable-and infamous-names on this list has to be Marilyn Monroe. 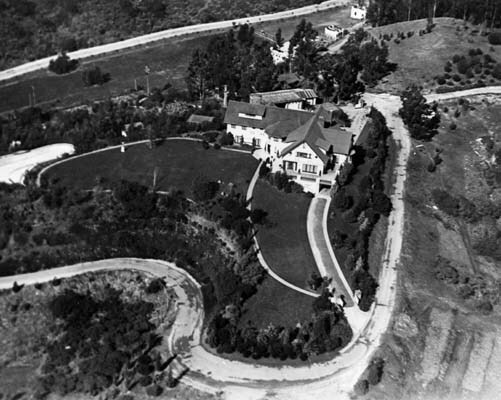 The starlet's drug-induced suicide took place in this Brentwood estate. The tragic home recently sold for $3.8 million (above asking price! ), and the spot above her crypt has also been sold to a private buyer. Buyers beware - but not that scared. Monroe occasionally puts in an appearance in her former Los Angeles home, but more often she is spotted in the Roosevelt Hotel, where she partied with Hollywood elite. Although, even at the hotel the sightings are of Monroe are innocent enough, typically just checking herself out in mirrors around the hotel. Crime didn't pay for gangster Bugsy Siegel. He was whacked in his girlfriend's Beverly Hills home in a drive by shooting. Bugsy was a major player in the development of Las Vegas as a gaming mecca, and was involved in some dirty politics surrounding the construction of the Flamingo Hotel. Bugsy's ghost is sometimes spotted ducking from bullets near a window in the home he was gunned down in, but more often he is spotted in the Flamingo. Bugsy's ghost is said to haunt the Presidential Suite in the hotel and visitors have seen weird apparitions around the pool table and bathroom as well as felt odd cold spots hovering around them in the suite. The "Queen of Comedy" was rumored to be quite superstitious and reportedly had some strange supernatural powers. While no black cats are crossing her path, Lucille Ball seems to be lingering around her old Beverly Hills mansion. Worth about $1.2 million, the home was recently sold to a private buyer. While Lucy may have some explaining to do, she certainly isn't the most haunting of our stars. Ball is said to go between her home and the Hart Building at Paramount Studios (where DesiLu Studios was located), and night watchmen have reported smelling her strong perfume. It looks like even Superman is not above a haunting good time. The home where George Reeves - star of the 1950s "Adventures of Superman" - lived and died is now the scene of a classic Hollywood mystery. After a night of partying, Reeves was said to have gone to his room and fired a single gunshot into his head, but many think there was more at play than a simple suicide. Not only is there confusion surrounding the death of Reeves, tenants have reported smelling gunpowder and hearing odd noises coming from the bedroom Reeves died in, as well as seeing Reeves in his old Superman costume at the foot of their bed. Talk about a creepy, and unwelcome, house guest. Harry Houdini made his money doing magic, but his life was also shroud in mystery. The mansion he is rumored to haunt was not really even his. This Laurel Canyon behemoth actually belonged to a friend of Houdini's who hosted lavish gatherings in the home for old Harry and the boys. Houdini stayed in the guest house (which had a tunnel to the main home) when he was in Los Angeles. Houdini's ghost is actually more evasive and secretive than the magician himself. Some people say they have seen or heard the ghost wandering around the guest home, but for the most part everything is quiet. Even Houdini's wife, Bess, got a little fed up with the spirit because he was not responsive during seances. Ilyce R. Glink is the author of several books, including 100 Questions Every First-Time Home Buyer Should Ask and Buy, Close, Move In!. She blogs about money and real estate atThinkGlink.com and The Equifax Personal Finance Blog, and is Chief Content Strategist atRealtyJoin.com, a community for real estate investors.